I get the impression that when most people hear ‘pea soup’, they evision a bowl of thick green goo. While I’ve seen my share of that style, I think– generally– split-pea soup has gotten a bad rap. It doesn’t have to be tasteless mush. 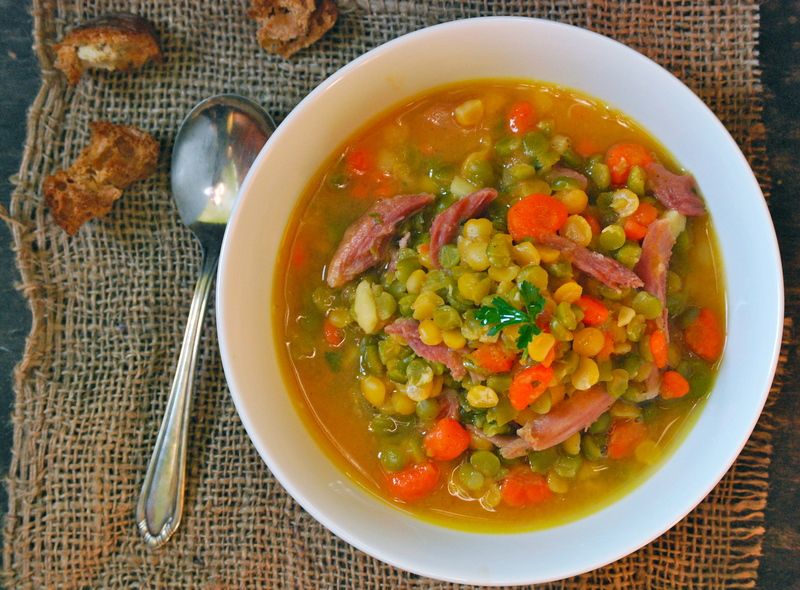 Instead, split-pea soup can be beautiful, colorful, and full of amazing flavors and textures. Of course, peas pair perfectly with the rich, salty flavor of a smoked ham shank. 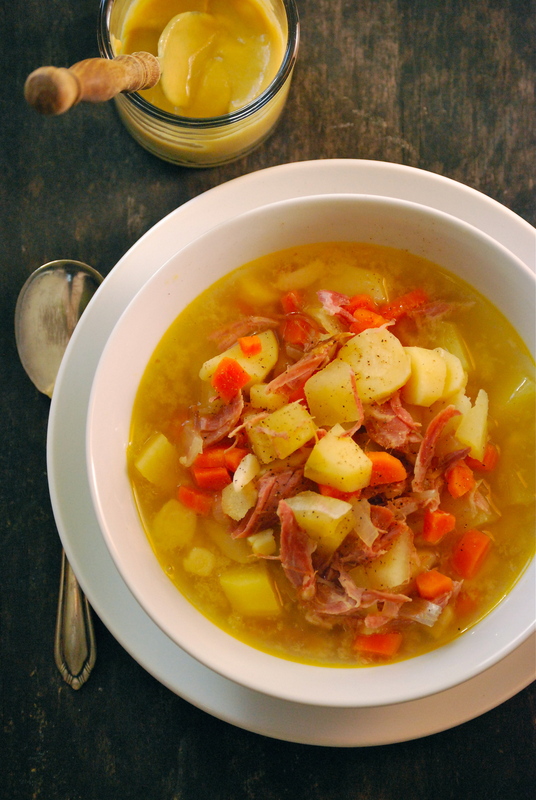 It may take a bit longer to get the wonderful ham broth, but it’s worth the effort. Keep in mind, you can cook the broth/ham shank and refrigerate it overnight or until you are ready to make the soup. 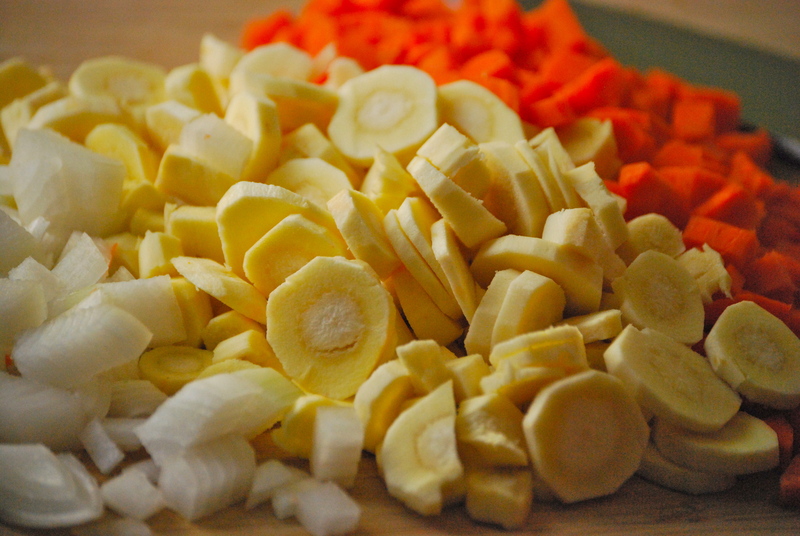 Aside from helping manage your prep time, doing so makes it easier to remove the fat from the soup. Then re-heat the broth and continue with the recipe. And remember, peas are best when handled delicately. Keep a watchful eye on them, as they cook rather quickly. I like them to retain their shape and to have a bit of a toothsome bite. Don’t forget to add the parsley and the lemon, as they really brighten this soup up. It’s a perfect finish. Hope you enjoy! In a large Dutch oven over medium heat add the olive oil. 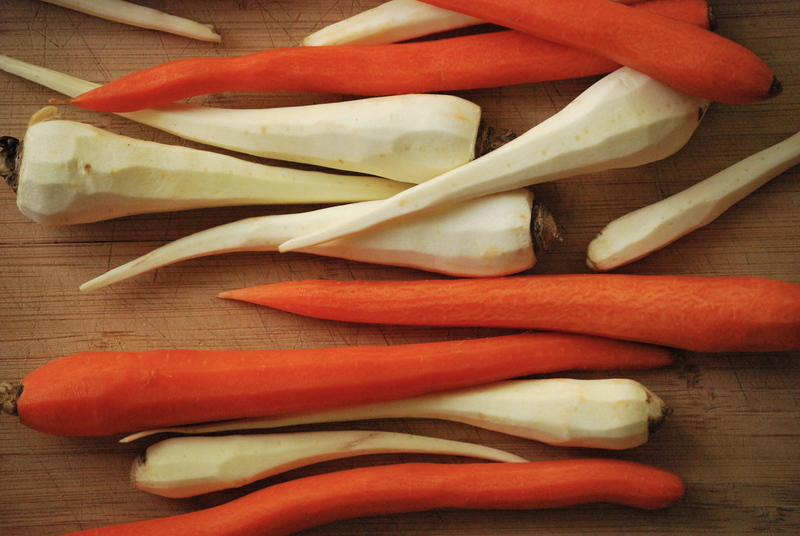 Sauté the onion, carrots, parsnips, and a sprinkle of salt and pepper for about 5 minutes. Add 2 quarts of water and the smoked ham shank. 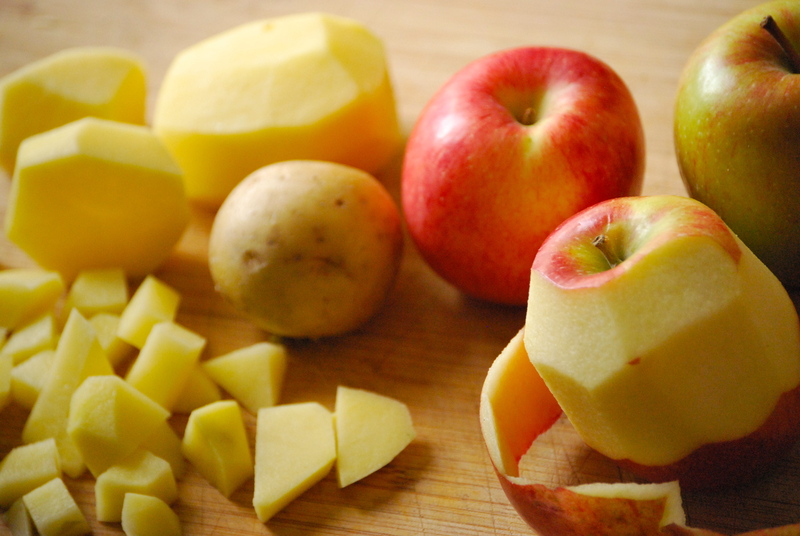 Bring to a boil and cover, then reduce heat to a medium simmer. Cook for about 2 hours, or until the ham shank is very tender and falling off of the bone. Remove ham shank from soup and shred the ham from it. Discard the bone. Meanwhile, take a spoon a carefully remove any fat from the broth and discard. Bring the broth back to a medium simmer and add the split peas and the shredded ham. 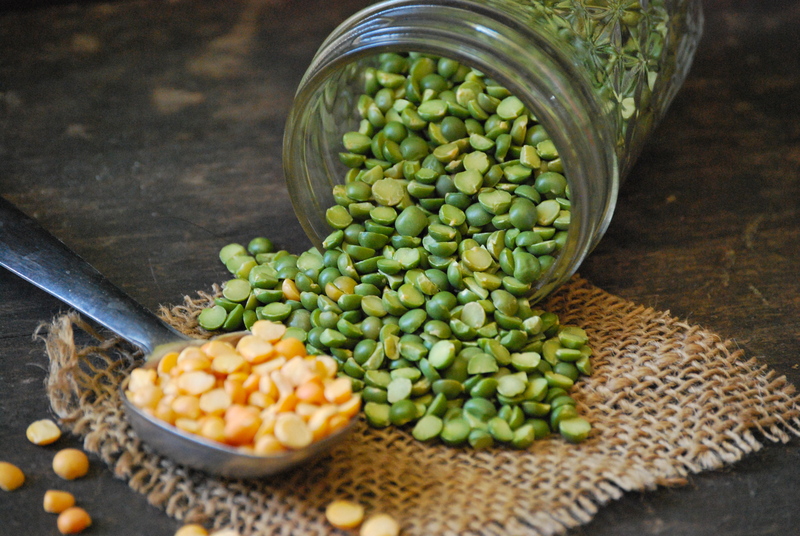 Cook the soup for another 30 minutes, or until the split peas are tender, but still hold their shape. Make sure to not over-cook it. Re-season with salt and pepper, if necessary. Stir in the chopped parsley and the juice of a 1/2 lemon. Enjoy! As always, thanks for stopping by Relishing It!